On Thursday, the Baltimore Police Department released the third of three videos since July that have raised accusations of officers planting or staging evidence. In this latest video, taken in June, two officers chase down and tackle a man suspected of dealing drugs. After his arrest, CBS reports, the suspect revealed the location of drugs tossed during the chase. The next day, officers search a clearing for the drugs; one officer has his camera on, one does not. The officer with his camera turned off discovers the drugs hidden in a bag, then leans down to pick them up. Turning to his partner, he indicates he’s found what he’s looking for. The officer then puts the drugs backs down, turns his camera on and then “finds” the drugs again. This is video from the officer, seen above, whose camera was turned off. His video footage only shows him finding drugs stashed in a bag, with no indication that he’d actually found them moments earlier. State Attorney Marilyn Mosby announced Thursday she was dropping more than 50 pending cases in Baltimore connected to either testimony or evidence submitted by the two officers. Overall, over a hundred cases have either been dropped or are under review in connection to the three body camera videos. Police commissioner Kevin Davis said he disagrees with Mosby’s decisions. Baltimore’s body camera policies don’t have a specific clause of “re-creation,” but it’s clear the video unearths circumstances “surrounding the recovery of evidence” that were not made clear in the original video. 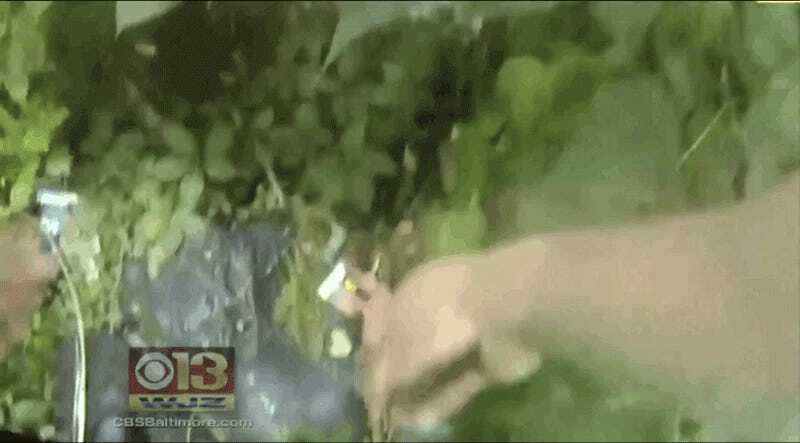 No charges are expected against the officers in the third video, and Baltimore PD emphasizes that it was the officers themselves who originally alerted the department.